This card is wonderful...sooo sweet...I love It. The scripty words are just beautiful! Love!!! So clever making the figgy pudding ballon. Love these sheep! Love how you used and combined elements from other sets. This is so cute!! I LOVE the combination of elements on this card!! 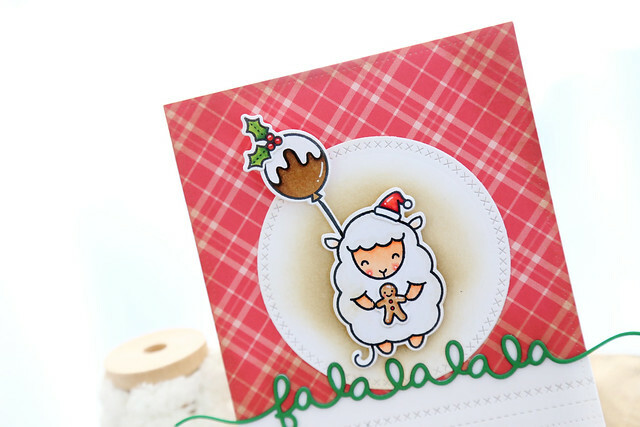 I love this sheep card it is so festive and cute!! !Great job! And the balloon made me laugh! Your card is so beautiful! Love your style! You are amazing! This card is full of super cute details! Oh how adorable that little sheep is!! Love the bold plaid on this one!